Remember back to the end of January, when I asked if you would vote for my photograph to win a contest on Facebook? And, so many of you voted that I WON?! 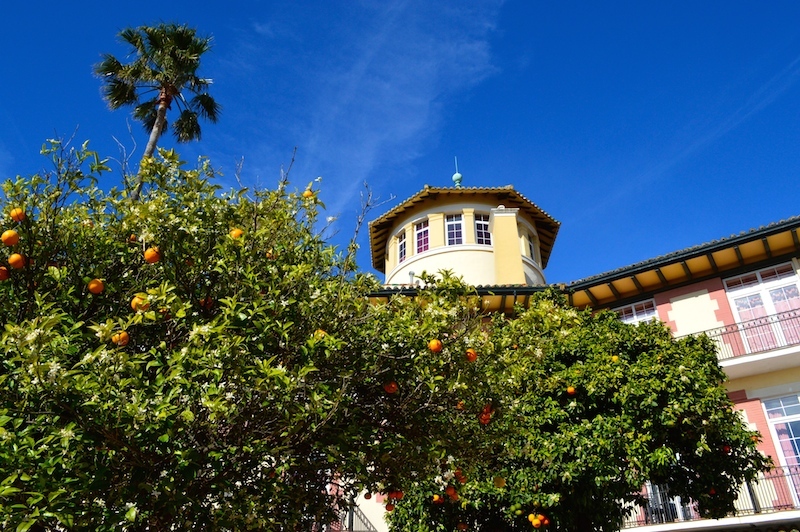 You might recall that the prize (offered by Toma Tours) was a day trip (with lunch), to one of the most picturesque parts of Andalucía, along a scenic train line known as Mr Henderson’s Railway – a British-built Victorian train line from Algeciras to Ronda. I promised that if I won I would invite along two local bloggers to share my prize – and take lots of photographs, so I could tell you all about it ….. so here we go! 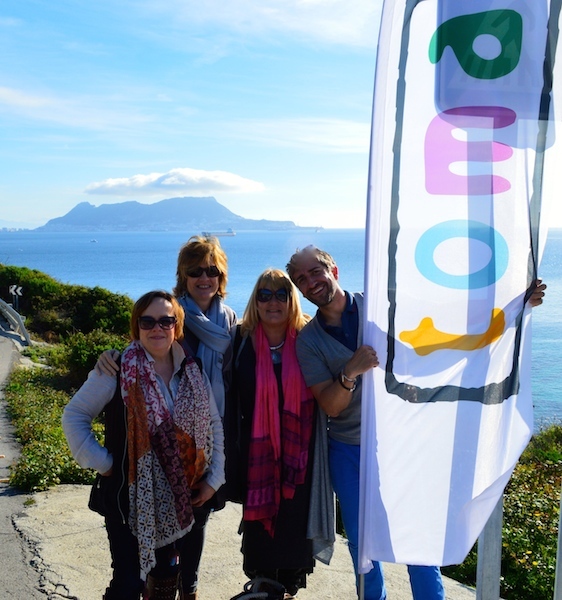 First stop of the day in Algeciras, with the Rock of Gibraltar in the background. So, I would like to introduce you to the two lovely ladies who came along with me last Saturday – Ali Meehan, founder of Costa Women, a Social and Business Networking Community for Women living in Spain (of which I am a proud member) and the Queen of Sherry, Annie B, who took a well-earned day off from her Spanish Kitchen (and who supplied the superb cream-sherry to accompany my home-made fudge on our train journey). Who’s the gorgeous guy next to me, I hear you ask?! NO – it’s not George Clooney, that’s Manni, founder of Toma Tours, and our highly knowledgeable guide for the day. 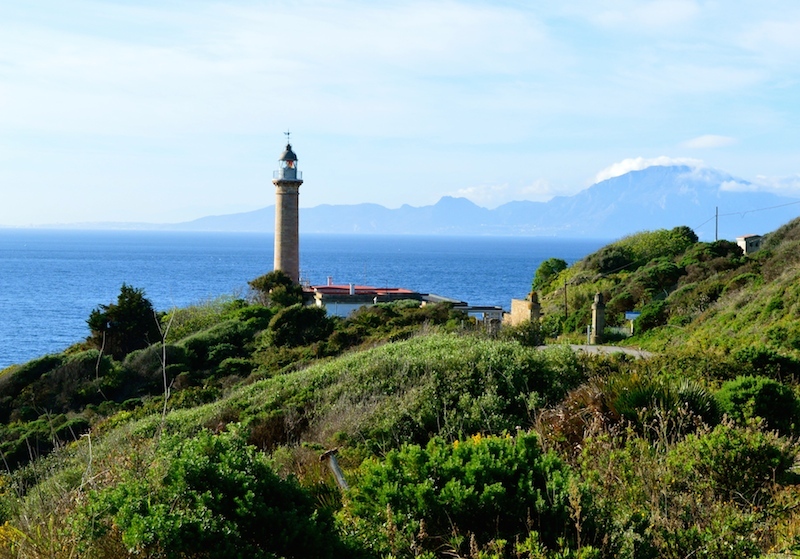 After meeting up with Manni in Marbella, we continued along the southern coast of Andalucía, past Gibraltar, to our first stop near to Playa de Getares in Algiceras, where we had glorious views from the lighthouse at Punta Carnero across the protected bay-within-a-bay, to Africa. We were obviously set for perfect weather for our special day. The route of Mr Henderson’s Railway cuts through breath-taking scenery from Algeciras to Ronda, taking in boutique hotels, trackside restaurants, trains, architecture, wildlife and history, as well as wonderful food and wine and is one of the most popular day trips run by Toma Tours. You can read more about the history of the railway HERE and HERE. We had time to enjoy coffee at the Hotel Reina Cristina, a rather grand British colonial-style hotel, with connections to the railway, and where many famous people including Winston Churchill, Arthur Conan Doyle and Charles de Gaulle have visited before us. Then it was off to the railway station at Algeciras where we boarded the air-conditioned RENFE train (which has now replaced the original steam engines) for the one hour 45 minute journey to Arriate, near Ronda. Manni gave us a map of the route, a book all about Mr Henderson to enjoy with our sherry and fudge, and strict instructions to make sure that the train’s conductor knew we wanted to get off at Arriate (which is a request stop only) before waving us off at the station. His task was to set off in his vehicle to meet us at the other end, while ours was to sit back and enjoy the fudge and sherry (much to the amusement of our fellow passengers) along with the stunning scenery and delightful stations along the route. Although the trains themselves have changed over the years, the scenery, 20 bridges, 16 tunnels and almost 750 metres elevation that the railway has to contend with remain as they have from the beginning. We skirted the cork oak forest of the Alcornocales Natural Park, negotiated mountains, rivers, scenic white villages, orange and olive groves and even sighted storks circling their huge nests. 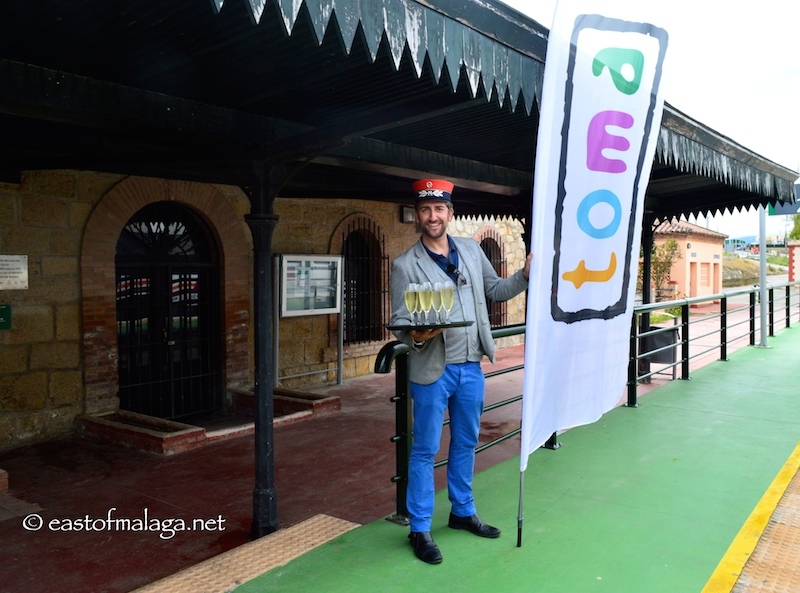 Just after 1.30pm we arrived at our destination, where we were met by Manni the Station Master who was waiting for us with glasses of cava (Spanish champagne)! So many passengers on the packed train were taking photographs of our memorable welcome and it’s certainly one I will never forget! WOW! Our lunch stop was at the delightful trackside restaurant of El Muelle de Arriate – but there was no need to worry about the noise of passing trains with only two arrivals each day! We feasted on huge “sharing plates” of goat’s cheese salad with mixed nuts and balsamic dressing; “Frank’s birthday cake” (named in honour of the friendly owner, Dutchman Frank) containing tender sliced potato, smoked salmon and mayo; tropical fruit salad and a platter of various pork cuts, followed by a selection of delicious desserts. After lunch, we continued our journey into Ronda with a visit to the Hotel Reina Victoria (sister hotel of the Hotel Reina Cristina at the other end of the railway line) for coffee, with spectacular views across Ronda’s famous gorge and landscape. Manni continued guiding us around Ronda with a walking tour, introducing us to the history of bull-fighting, the Plaza de Toros and the bullfighters’ Walk of Fame. Ronda is one of the most famous and oldest Moorish towns of Andalucía. Prehistoric remains show that the first inhabitants were here 25,000 years before Christ. Whilst the Romans built the first settlements, it was after the Moorish conquest in 711AD that it flourished. The town has an altitude of 739m and can be found 60 kilometres up a winding mountain road from Marbella on the western Costa del Sol, in the mountain range known as the Serranía de Ronda. Ronda sits astride a deep gorge, known as El Tajo, with a stone bridge linking the two sides. Built in 1793, it is called El Puente Nuevo (New Bridge), because there are also two older bridges spanning the gorge. So, after our amazing day, all that was left was for us to drive back down to the coast – but we hadn’t counted on one final surprise that Manni had in store for us. Sadly for you, he’s sworn me to secrecy, so you’ll have to book the trip to find out what it was. All I can say is that it certainly was a “moving experience”! WE HAD A FANTASTIC DAY RIDING ON MR HENDERSON’S RAILWAY WITH TOMA TOURS, AND I WOULD RECOMMEND THEIR TRIPS TO ANYONE. Thanks again, Manni! This entry was tagged Andalucía, Europe, history, life, lifestyle, Malaga, One trip EVERY month, One trip EVERY month Challenge, photography, Ronda, Spain, travel, white villages. Bookmark the permalink. 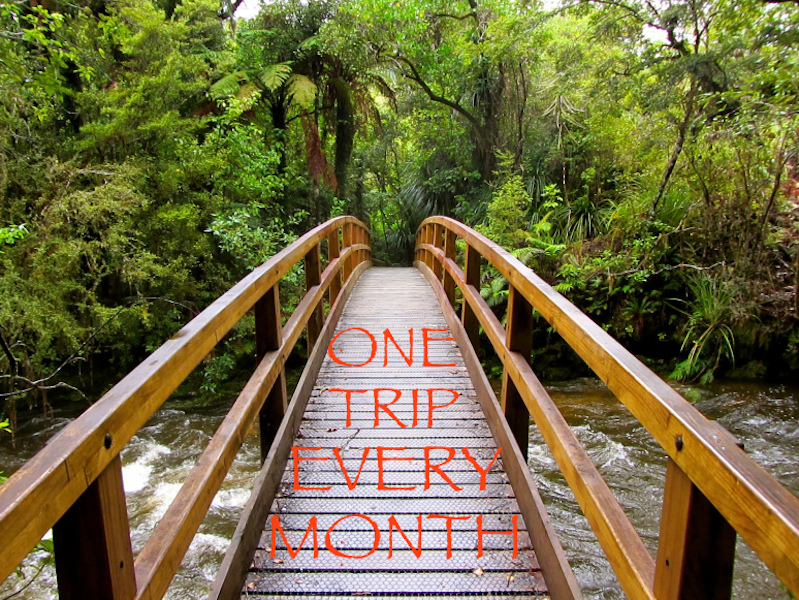 Congratulations on winning this amazing trip for your picture, Marianne. It looks like it was a fabulous day, with lots of great company (fellow bloggers and handsome Manni! ), beautiful views, a great guide, and a most delectable feast. Wonderful!! On our list for our next visit to Spain! Thank you for for introducing me to this wonderful trip! Congratulations on winning such a brilliant prize! I’m sure you will enjoy Ronda – it’s a great place to visit.. Congratulations!! You lucky girl you 🙂 Appreciate the virtual tour. What a fabulous prize, Marianne 🙂 I always wanted to see Ronda, and that was some style you did it in. Then again, you are a very stylish lady 🙂 Congrats! Awww … shucks Jo, you flatter me! Loved reading this. Well done, you! I have to tell you that this is an absolute MUST for me if I ever get back to your neck of the woods! I’m crazy about trains in all their forms, but this looks like the a step back into rail’s golden era. Truly amazing place… What not there? Your quite right, Sreejth – you DO need a month to explore and photograph this beautiful place – but alas, I only had one day! Fortunately, I’ve visited Ronda on a number of occasions before, and will no doubt go again, so there is always some new aspect to it, for me. What a wonderful prize and such a memorable day. I have done research on Ronda as I would love to visit the town someday. Thank you for the inspiring post with such lovely photos. What a stunning prize! I’m sure your two friends were more than delighted to accompany you. I thought that sherry and fudge sounded rather decadent, until I saw the fabulous lunch. “Frank’s Birthday cake” looks absolutely scrumptious. 🙂 Great photos of this beautiful place, Marianne. My friend, Anne, is also a sherry educator, and when anyone attends her cooking school, she explains all about which sherry accompanies each dish. She had tried my fudge before, and asked if I would take some along, so she knew exactly which sherry would suit. She certainly knows her sherry! Thanks Roberto. Yes, the food was exceptional and very well presented. I’ll definitely return to El Muelle de Arriate next time I’m in Ronda. I would have loved to have taken ALL my online followers and friends – but poor Manni wouldn’t have been able to lift the cava! We had sunshine earlier in the day, Suzanne, but after lunch the cloud came over, though it was still warm. wowowowow!!!! omg that food looks so delicious!! and that scenery, wow. was the last surprise a night of flamenco dancing? fabulous photos!! I agree. It seems worth more than a lot of other things. The idea of completing something…so many thing today have to go without that..
Congratulations! What a faboulous day! And the photos are all gorgeous…the food too! Ronda is a very photogenic town – sorry about the rain though. I’ve never seen it in the rain. Sounds like a magical trip Marianne.I’m glad you had such a wonderful day. Like Andrew, my invitation must have been lost in the post. Congratulation, Marianne! How exciting 🙂 What a fabulous luncheon. Thank you for sharing the wonderful tour! My invite must have got lost in the post? Congrats on winning. Thanks for taking us ALL along. Beautiful. We caught the 11.45am from Algeciras, arriving into Arriate at 1.30pm. No, we didn’t catch the train back – Manni drove from Algeciras to Ronda whilst we were on the train so that he could drive us back down the mountain road from Ronda to Marbella.